In the meanwhile the scorpion slipped and fell into the river and started struggling for life. Upon seeing this, the second pupil picked it up with his own hands, and put it back on the banks. But, while doing so the scorpion stung him and soon he was in deep pain as the poison started spreading. The first pupil, on seeing the second one in deep pain got very angry and said, ‘You did not follow the teachings of the Guruji and that is why you are in deep agony now.’ The second pupil reacted, ‘No I have followed his teachings, and he can’t be wrong.’ And that started the vehement discussion between the two, about the teachings of the Guru. 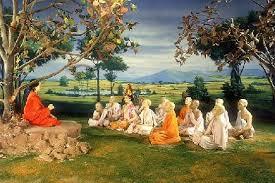 The first pupil said, ‘But our Guru has also taught us to keep away from bad people and to protect ourselves. But you have violated this rule of the Guru, and that is why you are in deep pain. ‘When I taught you to stay away from bad people and things, what I meant was don’t let yourself get polluted by the evil. And every intelligent person should do this only till he doesn’t develop the inherent capacity to completely remove the evil from the society. When I taught you not to give up your helping nature, the objective behind was to teach you service. You should be like a true doctor, who doesn’t decipher between enmity and friendship and only concentrates on reducing and removing pain. In this episode the second pupil got mixed up with both the teachings. It was his duty to save the drowning creature. But he could have used a stick for that. There was no need to use your hand. By using a stick he could have saved that scorpion and also protected himself. ‘If the evil is powerful and big, what should one do?’ asked a pupil. The guru replied, ‘your first obligation is to save yourself, because to stay alive is the biggest obligation of life. Later on if it’s possible you can kill the evil with your materialistic and spiritual powers. This interesting story tells us how we should help others and while helping others we should also keep in mind that we don’t hurt ourselves. And as our gurus have said, help others by keeping yourself safe.